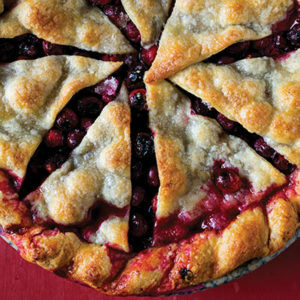 Try this cranberry pie in the fall or winter when you are craving the bright taste of a sour cherry pie. Add pecans to this filling if you’d like, as well as some orange zest or liqueur, and serve it with champagne. There is a lot of naturally occurring pectin in cranberries, so not much thickener is needed. On-Demand: Listen to Faith’s conversation with Kate McDermott about this recipe as well as several other Thanksgiving recipes, including a Pumpkin Pie and a Gluten-Free Nutty No-Bake Crust. Need more holiday recipes? Check out our page devoted to Our Best Thanksgiving Recipes. 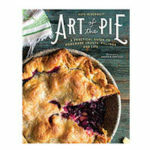 Excerpted from Art of the Pie: A Practical Guide to Homemade Crusts, Fillings, and Life by Kate McDermott. Published by The Countryman Press • A division of W.W. Norton & Company. Copyright © 2016 by Kathleen L. McDermott, Photographs Copyright © 2015 by Andrew Scrivani. Place 3 cups of the cranberries in a food processor and pulse until they are slightly chopped. In a medium bowl, place the chopped and remaining whole cranberries, sugar, cornstarch, nutmeg, salt, zest or liqueur, and optional walnuts, and mix well. In a pie plate lined with an unbaked pie dough, pour in the cranberry filling and dot with butter. 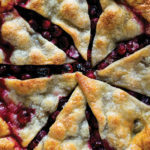 Roll out the remaining dough, lay it over the fruit, and cut 5 to 6 vents on top, or cut strips and make a lattice top. Trim excess dough from the edges and crimp. Chill the pie for a minimum of 1 hour before baking. In an oven preheated to 375°F (190°C), bake on the middle rack for about 40 minutes. When there are about 10 minutes of bake time left, open the oven, pull the pie out, and quickly and evenly sprinkle the top of the pie with sugar. Close the oven and bake until the crust is just golden, or until you see steady bubbling coming out between the vents. Remove the pie from the oven and cool completely before serving. I loved this pie! But I’d love some advice on why it didn’t set up very well. A serving was more like a crusty puddle than a slice of pie, but so delicious. By the way, I played with the recipe the other day by adding about a cup of so of kumquats (chopped up in my food processor) and a half-pint container of raspberries, plus some fresh grated ginger root and a pinch of clove. Awfully good! Thanks so much for the continuing inspiration! I misread the recipe and used 2.5 T of cornstarch instead of teaspoons. My pie set up beautifully and no soggy bottoms!!! Love this recipe. I also only used 1/2 cup sugar and subbed 1/2 of lankato golden sweetener.